Trauma such as automobile crashes, falls, gunshots, diving accidents, war injuries, etc. Tumor such as right, ependymomas, astrocytomas, and metastatic cancer. Ischemia resulting from occlusion of spinal blood vessels, including dissecting aortic aneurysms, emboli, arteriosclerosis. Developmental disorders, such as spina bifida, meningomyolcoele, and other. Neurodegenerative diseases, such as Friedreich’s ataxia, spinocerebellar ataxia, etc. Demyelinative diseases, such as Multiple Sclerosis. 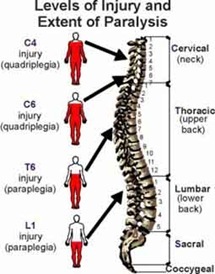 Transverse myelitis, resulting from spinal cord stroke, inflammation, or other causes. Vascular malformations, such as arteriovenous malformation (AVM), dural arteriovenous fistula (AVF), spinal hemangioma, cavernous angioma and aneurysm.